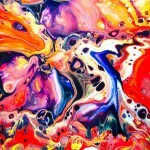 Zeus – Warm abstract acrylic painting on canvas created in acrylic paint pouring art technique. The Ancient Greeks believed that Zeus ruled the sky and all of the other deities in their pantheon, and the Zeus Modern Wall Art Print seeks to capture the magnificence of the ancient god. Electric purple color signifies his royal statue while the blues and greens represent the sky that he had dominion over. Below, the dark purples and hints of brown represent the earthly realm that he also ruled. 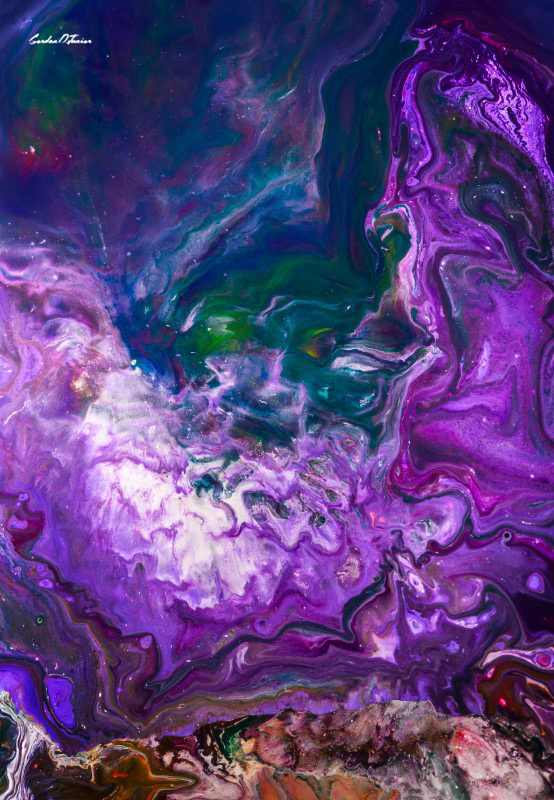 A vertical composition, this modern art print is produced from an original acrylic on canvas piece that was made by pouring paints and allowing the colors to naturally blend. 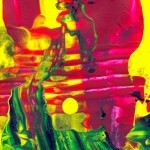 This abstract acrylic painting on canvas is a part of Abstract Paintings Collection by Gordan P. Junior. Colorful vertical abstract composition with purple, and dark green-blue cold tones as dominant colors.